Who ever heard of a youth soccer club that encouraged players to fail? How about one that warned parents mistakes would be made, or one that will not accept mid-season transfers no matter how much they might help? You could call that club iconoclastic. You could also call them innovative and successful. You could definitely call them the Southern California Blues. 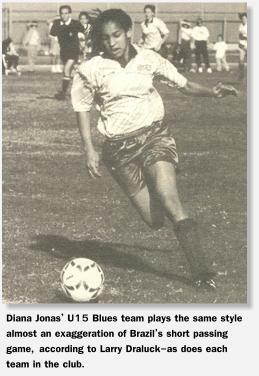 The Blues, a female-only club based in Orange County, were formed in 1985 as an adult women's team, featuring such players as U.S. national team players Julie Foudy and (then) Carin Jennings. Since the formation of their first youth teams in 1990 they have become one of the most recognized girls' clubs in the Golden State. Under the leadership of director of coaching Larry Draluck and associate director Tad Bobak, they do things their own way. Now that approach, which emphasizes long-term development over short-term results, and off-the-field conduct as much as on-the-field play, seems to be paying dividends. The U-l9 girls captured the Blues' first-ever USYSA Region IV championship last year. In 1994-95 the U-18s were California Youth Soccer Association South champs; the next year the U-10s won that title. In 1996-97, the Blues boasted four CYSA-S champions, at the U-11, 15, 17 and 18 levels. 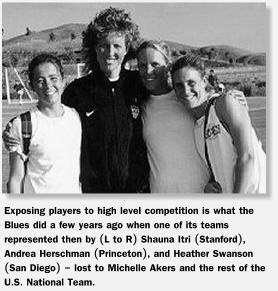 Blues graduates have gone on to play at such colleges as Yale, Princeton, Stanford, California, Santa Clara, UCLA, San Diego State and Nebraska; 14 of the 18 girls on the 1996-97 U-l9 team received partial or full scholarships. Yet Draluck insists that while championships are nice, they're not what the Blues are about. The 38-year-old "A" level coach, who played professionally for UAG in Guadalajara, Mexico, and coached NCAA Division I men's and women's teams, sees soccer as a means to an end. "There's a whole world beyond the touchline," he notes. "Soccer can shape someone's life. Soccer is important, but not all important; it's what you learn through soccer that is." Draluck should know. A self confessed "directionless, troubled young man" whose father died when he was 15, he credits Berhane Anderberhan, his coach at Cal State-Los Angeles, with turning his life around through soccer. Though the girls on the Blues teams are seldom in desperate straits, Draluck feels the game can offer them many of the same life-long benefits. The Blues' mission statement reads: "To develop the talented female athletes of Orange County as quality people, students and soccer players, teaching and emphasizing the beauty of the game, unity and winning, all the while assisting in the growth of young girls into athletic, strong, confident and independent women." That's pretty dry, he admits. So he adds his own words: "Tad and I and our staff want our players to become great people, and achieve goals. Our job is to give them the guidance to do that without taking too many wrong turns." Draluck knows that a few wrong turns are inevitable. "We're taking a long, tedious approach," he explains. "Part of that means giving players an opportunity to fail. All too often we as coaches or parents take decisions away from young people. We can't stand to see them fail, because we don't want them to experience pain. But in the long run that doesn't do them justice. Failure— and learning from it, and how to deal with it is part of soccer, and life." The Blues' style described by Draluck as "almost an exaggeration of Brazil's short-passing style, with a premium on creativity" virtually guarantees that there will be failures. Players have a hard time mastering it; young Blues teams are often beaten by those that play long-ball, or are stronger physically. However, because the Blues keep the core of each team together for a long time, and play the same style no matter what age, the philosophy pays off as the girls get older. Not only do they play an attractive, fun game, they also win. And as they grow they develop both competence and confidence—and an understanding that hard work pays off over time. Draluck's insistence on playing creative soccer, forcing girls to make their own decisions, and learn from them, means that sometimes teams lose key games. He is not enamored of state cups. "If it wasn't for the pressure put on by parents to win games, club coaches everywhere could do a better job," he says. "Without the pressure of cups we would be free to use the environment of soccer to teach, rather than win." On the Blues, he and his staff try to teach as much as possible. Draluck is not a big fan of parental over-involvement either. Yet unlike many youth soccer administrators, he is doing something about it. All Blues players, parents and coaches sign a detailed agreement designed to head off as many problems as possible before they occur. It states explicitly that members of the Blues agree to put their team ahead of themselves. If conflicts arise between the team and a player or parent, the coach (under Draluck's direction) is empowered to make decisions for the good of the team; those decisions are final. Similarly, the Blues also agree to put the club itself ahead of the team. When conflicts arise between the club and an individual team, the club comes first. Decisions of the board of directors are final, and without appeal. The player/parent agreement spells out specific policies for virtually every problematic situation in youth soccer: tryouts, player evaluation and selection, commitment, playing time, positions, lineups, travel obligations, even sideline conduct by parents. "This is a living document; it changes year to year," Draluck notes. "In order for our players to be good human beings, they need to see good conduct by the adults around them." Draluck does not like to be distracted by what other clubs do. Take, for example, the Blues' policy on transfers. "So many times during the season, when their team starts losing or another one starts winning, overzealous parents want their kids to change teams. We tell every girl who wants to transfer to us, "No. Not now. Honor your commitment to your team first." In addition, he says, constantly adding and subtracting players is no way to build long-term success. "We prefer our players to be with us a long time. That way they can learn the system, learn the terminology, learn the coaches." Because every Blues team plays the same style, he says, players and coaches are easily interchanged throughout the club. And the Blues are truly a club. Young players are encouraged to attend older teams' games. Teams often train together, and a spirit of camaraderie is encouraged by coaches. It is not unusual to see young girls playing with and against adult women. The Blues even have their own web page (www.scblues.com), one of the most well-designed of any soccer club in the country. It includes information on teams and games, photos and links, as well as strongly-worded notes on the dangers of short-term thinking. Though the Blues enjoy a first rate facility in San Juan Capistrano, the club is not wealthy. Draluck is now turning his attention to sponsorship. One thing he is not pursuing is the addition of boys teams. Though he enjoys coaching males—his current ODP team is boys U-16 he fears "watering down" the club. "Whenever you take on something new, you run the risk of spreading yourself too thin," he says. "We know what we want to do now, and we're getting pretty good at it. Besides, being an all-girls club is one of the things that makes us unique."